That's me with Garrett. Dude, I shaved for this! 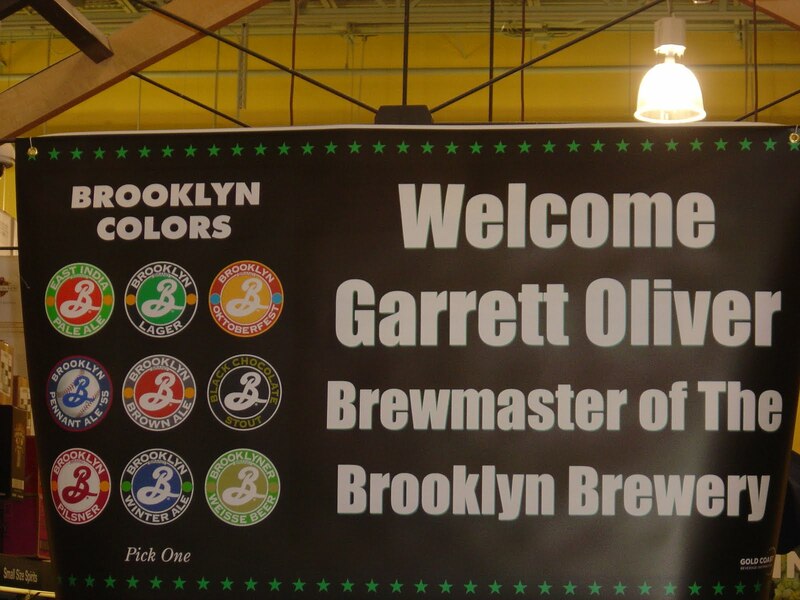 Brooklyn Brewmaster Garrett Oliver was in town tonight. He had a closed-door (meaning I was shut out, though I did watch some on the security camera) gathering with 30 or so Total Wine associates in the giant classroom in their Pembroke Pines store. That was to end at 6pm with a public tasting and book/bottle signing to take place from 6:30 - 7:30, you remember right? That left 30 minutes for me and fellow blogger Tony to do a thorough interview... in theory! Things didn't quite go down that way! Well, the exclusive Total Wine worker deal ran 29 minutes late (damn, I knew I should've applied for a job there), so that left one minute for an introduction between Garrett, me, Tony and a few of my local buddies. Over to the public event space right away. There was a line of 20-30 people. So we went to the end and talked about how much we love quarter-ounce shots of Brooklyn Lager! Finally to the front of the line. A few pictures, a few questions, a few signatures. The line died to nothing shortly afterward, with 30 more minutes left in the appearance. Garrett came over to where Ed Roberts was pouring some Brooklyn beers while suggesting goat cheese to go with them. It wasn't but five minutes later that I saw Garrett standing behind the table, not talking to anyone. Enter interview-that-didn't-happen mode! I asked about 10 questions in a row, and Garrett answered all of them awesomely. It wasn't a one-on-one but this style Q & A, with an audience was really great! He's a very charismatic guy that loves to tell stories and is super-passionate about beer and brewing! Don't quote me on this stuff, but it's mostly legit (I didn't make this up and wasn't dreaming). And for sure I don't remember all of the conversation, but Ed has some high-quality cell phone footage he'll probably share at some point. 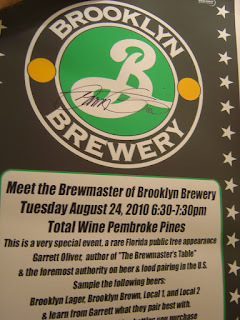 While Garrett was signing my bottle and book, I told him that I had heard he said he's the only one who has to love all of Brooklyn's beers. He agreed, saying he'd be suspicious if someone told him they liked everything. Whew, that was a relief! So I asked him if he had a favorite to which he predictably didn't, but named a few based on seasons at which point I told him we didn't have seasons down here in ridiculousland Florida. 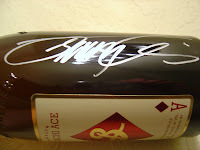 I also mentioned my favorites were Sorachi Ace (see signed bottle pic below) and Black Chocolate Stout, mid summer. First question in the crowd-watching interview. I basically asked Garrett if he considered himself a specialty chef. He thought that was a good analogy, chef v. brewer, and spoke to the way chefs approach their ingredients. He also talked about how there are many different types of chefs, from the super-hands-on to those that are much more involved with the menu, sticking to the metaphor. I did follow up later with a question about how many attempts they need before he's happy with the final product. Surprisingly, he said they usually don't set up several test-runs and then brew, they just do it. But he did admit hustling to get things in order with their Buzz Bomb and Manhattan Project beers. By the way, did you know these guys brew beers just to drink amongst themselves? I really need to get on that list, and said so! Next question, his opinion on the South Florida beer scene. Garrett had no problem suggesting that we started sluggishly, but have been catching up with a devoted fan base. He even thanked Ed for helping to grow the local craft beer community! Mike followed up with a question if he had ever heard of Cigar City. Garrett said he had recently reviewed their Maduro beer and mentioned a large tobacco flavor he got from the beer. I told Garrett I saw him in an interview with a guy from Sweden and asked about his international role. He told me Swedish people drink a lot of their beer. Yeah, me too. Ed live tweeted during their private meeting that Garrett mentioned a beer in the future with Brett, so I asked about it. Garrett said yes, but then suggested that space and aging time are necessary for that type of beer. We both laughed when he realized that Brooklyn Brewery is undergoing a major expansion and those needs are met now. I told him no more excuses to a big "hahaha". Finally, I asked him about the wood and barrel aging that has been going on with so many breweries. The conversation went to Brooklyn Black Ops, a bourbon barrel aged beer. 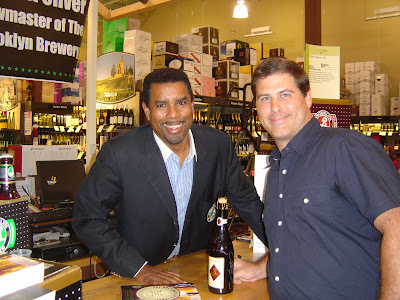 Ed Roberts' ears perked up at that point because he just had Garrett sign two bottles of that beer for him! (BTW. That beer will never be opened. Guaranteed!) Garrett said that it might not be better, but the fact that this beer was refermented in the bottle for sure made it different. He also pointed to the difference between the different woods available. Beam wood is different from the one they use, for example. At the very end, we went back to the food and beer pairing topic, with Garrett finally admitting he basically can remember the taste of food from decades ago. Experience along with that memory has led him to be able to be the expert he is when it comes to hosting beer dinners and writing books on the subject. He compared his skill to that of a musician writing the music for a song. It's there in his mind! 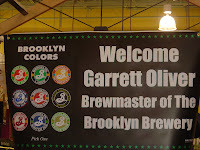 I also wanted to mention that the local Brooklyn Brewery representative was there as well. Rich Nowak, who I met at another tasting in the same Total Wine, was super awesome and provided a number of interesting stories himself. Rich started back in 1991 when the company had one truck and one van, which he drove. Garrett didn't even work there then! He said he remembers Garrett coming for an interview in 1994 with his Black Chocolate Stout for his interview! Now that is something you won't hear from many people. That is an awesome tidbit, which Garrett confirmed later. Oh, Black Chocolate Stout, you're my favorite and I love you dearly! Thank you, Rich, for helping to make this happen. If you hadn't noticed, I had a great time tonight! 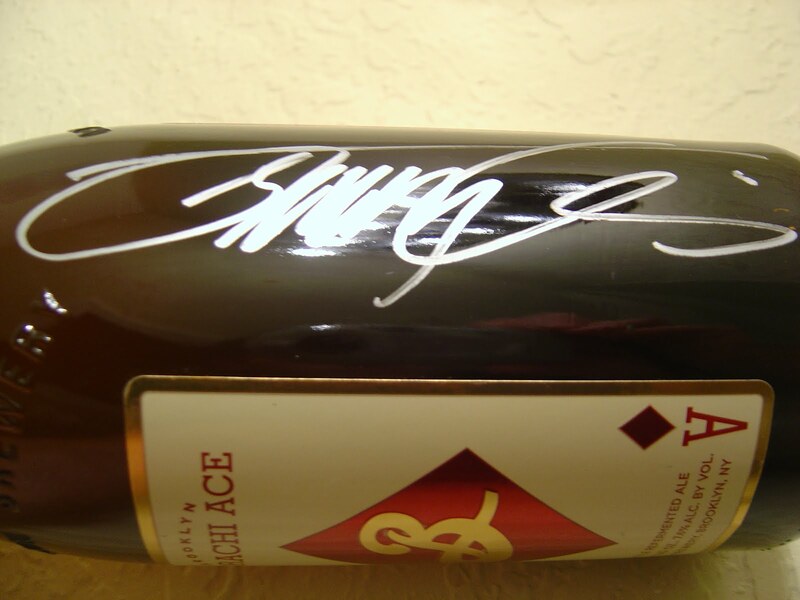 Got my bottle signed. Got my book signed. And you know what? I took the poster from the front of the store and Garrett signed that for me, too. Those are the perks of being a regular! Again, I'm sure I missed something. But it was a great night with old and new friends. These dudes went across I-75 to "The Pub" afterward, but I decided I'd rather read my children their books before bed. Later. 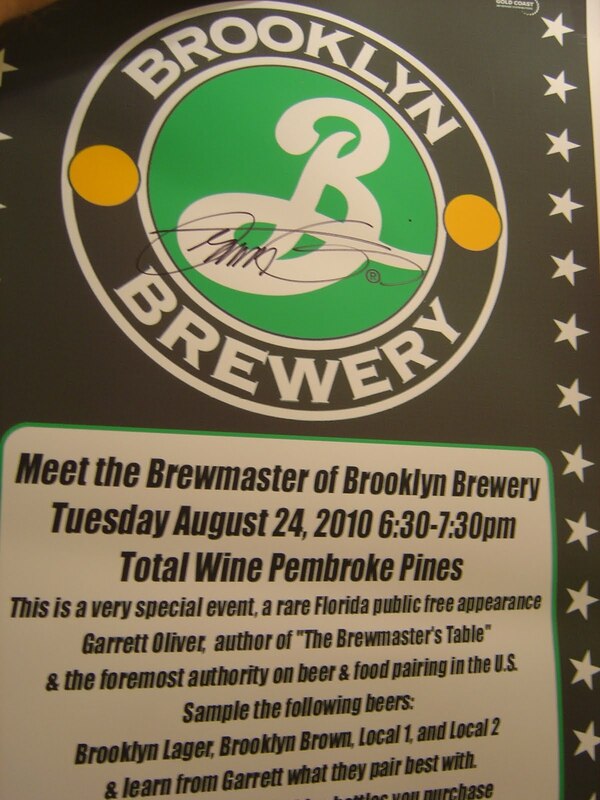 This is the autographed poster from the front of the Total Wine store. Hey Hannah. Yeah, of course I ran into Tony. He and I were the ones that were going to interview Garrett between sessions. He also is the photographer of me and Garrett, the one at the top. He got your book signed as well, but not without fending off a lady that wanted to buy one of his copies first. Good thing he's a Marine! You're a groupie! Brewers really are like rockstars. Glad you had so much fun...great post. Also, your tan could use some work, Mr. Florida. Huh? I have a killer tan, but it's because I just got back from a week on the beach in NJ. I stay out of the sun here. Must have been the lighting. Very awesome. I'm jealous not only because you got to talk to Garrett, but because you had the sack to stick with it, find time to talk to him, and then talk when the opportunity arose. I sometimes lack the very last piece because I'm nervous (although I'm getting much better). But I digress. Excellent job. Good read! Garrett is very approachable, but it was cool to ask a bunch of questions. Lots of others asked things too, and he even went out to a nearby bar afterward and kept chatting. I skipped that last part. I don't think you need to be nervous. You seem to usually say what's on your mind, and people like you for that.